Micro Mesh MMR Sheets - Use these products for finishing plastics, acrylics, polycarbonates, bakelite, fiberglass, gel-coat, urethanes, celluloid, lacquers, fiberglass, cast polymers, soft woods, cultured marble, coatings, composites, and more. 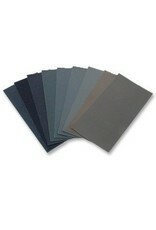 Abrasive colors of this product range from dark grey to light grey. This material is made to be used wet or dry, is made with a flexible cotton backing with polymer emulsion cushioning layer and large micron graded silicon carbide crystals suspended in an ultra flexible resin bond. 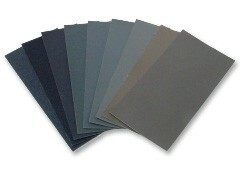 *Grades 8000 and 12000 are made with aluminum oxide crystals. This material is available in the following 9 grades, from coarse, to fine:1500, 1800, 2400, 3200, 3600, 4000, 6000, 8000*, and 12000* REGULAR. 1500 Micro Mesh is equivalent to a scratch pattern left using 400 wet/dry, but is much more consistent. Sheets are 6in. x 3in.